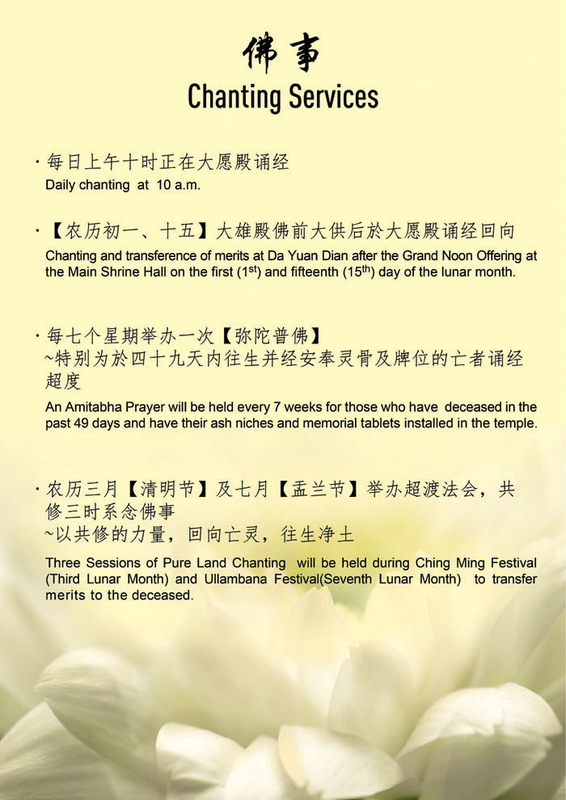 Ancestral prayer is an age long practice for the Chinese people. The Da Yuan Dian (Shrine of Great Vow) is a prayer hall named after Ksitigarbha Bodhisattva (Di Zang Wang Pusa or Earth Store Bodhisattva) as well as a place for devotees to install ancestral tablets for their departed ones. It was officially opened in December 1998 by the late Most Venerable Chek Huang. At present we have more than 5,000 units of space for tablet installation. Individuals from the public may donate to Than Hsiang Educational Fund to obtain a place for the tablet. We will be glad to show interested parties around. Please call on us during office hours. 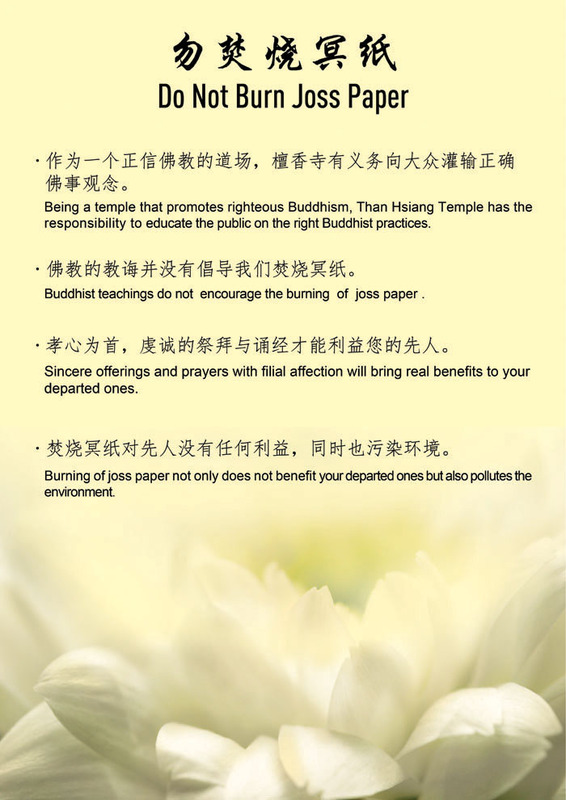 • annual Grand Dharma Assemblies will be held during Ching Ming Festival and the 7th Lunar Month. 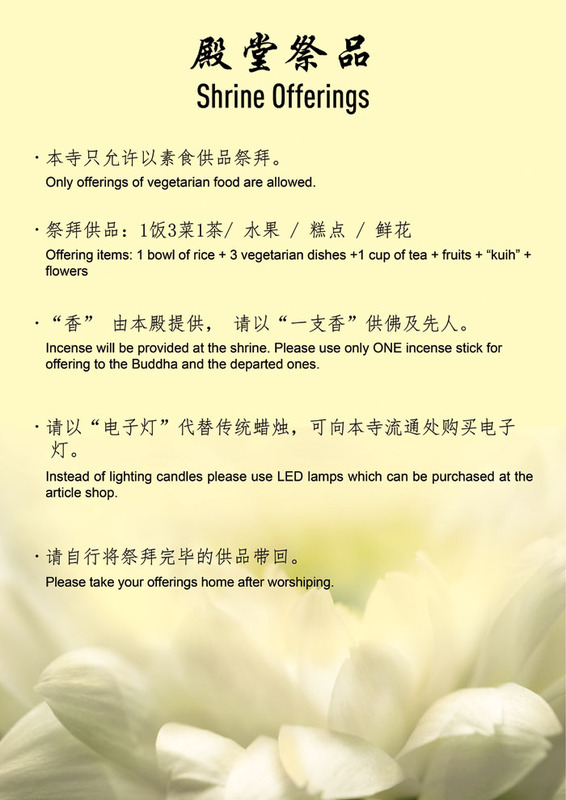 Devotees can make separate donations (in any amount) for the penitent service. • provision of a spacious environment supplied with tables, incense, cups and plates, vases, etc. 2) Donors – can donate to obtain tablets for parents, relatives, ancestor or themselves but not for unborn babies, infant spirits, karmic creditors and pets.